To maintain optimum oral health between your visits to Dental Health Care Associates, it’s vital to practice an effective oral hygiene routine. This includes brushing your teeth for at least two minutes, twice a day. To help you brush correctly, our dental hygienists have provided some additional helpful tips below. A soft-bristled toothbrush with a small head enables access to hard-to-reach areas within your mouth. Unlike hard-bristled brushes, it also won’t scratch your tooth enamel. Hold your brush at a 45-degree angle against your gum-line and brush from where the tooth and gum meet to the chewing surface in gentle short strokes. Be careful not to brush too hard, as this can cause receding gums, tooth sensitivity, and over longer periods of time, loose teeth. Use the same brushing method above to brush the outside and inside surfaces of your back teeth. Tip the bristles to ensure you get into the pits and crevices of your back teeth. 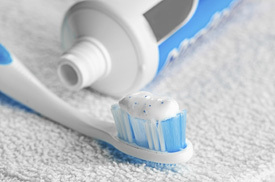 To clean the inside surfaces of your top and bottom front teeth and gums, hold your brush almost vertically. Then, with back and forward motions, bring the front part of the brush over the teeth and gums. Using a forward-sweeping motion, gently brush your tongue and the roof of your mouth from back to front. This can sometimes take a little getting used to, but it is an important part of total mouth cleaning as it helps to remove odour-causing bacteria and freshen your breath.